This contrasting flame cap is made from cotton twill and is a structured cap which is mid profile. 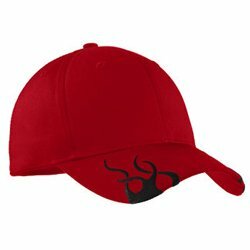 This racing cap features a hook and loop enclosure meaning velcro and it features a pre-embroidered flame design on the bill. This cap comes in 3 racing colors and is available blank, or customized with your logo.